Intowow's new tech serves latency-free VPAID content for the first time. Groundbreaking technology is making VPAID available for any in-app video ad placement, opening up massive earning potential for apps. At last. We're not meeting video ad demand. Poor latency, viewability issues and invalid content create ad serving issues – and until now, there are few answers. Definition (VPAID) content, making the largest source of cross-screen video ad demand viable for all in-app ad placements for the first time. The latest version of the technology – VPAID 2.0 – is HTML5-compatible, keeping the format alive as Flash dies. diversify ad buys and reduce reliance on Facebook or other outlets. For publishers, increased ad demand raises fill rates and drives yield optimisation with more bidders in play. Higher fill rates and higher prices mean higher revenue. Until very recently, Video Ad Serving Template (VAST) videos, which allow for basic ad serving, was the only option for in-app use. But industry sources suggest VAST-format content satisfies only a fraction of all cross-screen video demand. Due to the layers of code inherent to VPAID – which allow for better tracking and interactivity – the possibility of code errors increases, which in turn increases the likelihood of ad failures or invalid content. Code errors cause failed ad requests, which result in developers serving less ads and making less money. Intowow SDK serves latency-free VPAID content and removes blank ad-screens. As an early-adopter of both Moat and IAS certifications, Intowow provides accurate viewability metrics and uses that data to meet advertiser requests such as viewable cost per thousand impressions (vCPM). For advertisers, this increase in cross-screen functionality extends the reach and execution of campaigns to include in-app video, while offering greater functionality and control of in-app content. With app use at an all-time high and advertisers already paying a premium for mobile video-views, developers have the potential to reach and monetise previously inaccessible video ad demand. 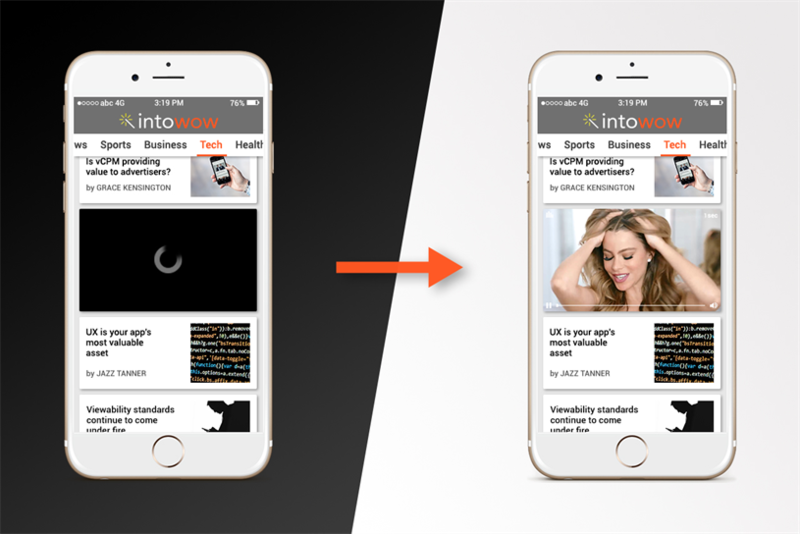 delivers premium video content from advertisers who demand flawless in-app ad execution. The result is an increasingly native experience that serves users, developers and advertisers better than ever before.